Tab Ramos, 2016 inductee into the North Carolina Soccer Hall of Fame, was born in Montevideo, Uruguay, on September 21, 1966. He was introduced to soccer at an early age, as his father played professionally in his home country for 13 years. So it was logical that Tab would bring his interest and passion to the United States when the family moved to Kearny, New Jersey in 1977. Playing at Saint Benedict Prep and in club soccer with future U.S. National teammate John Harkes, Ramos would become a soccer legend in New Jersey. He was a two-time high school All-American and Parade Magazine Player of the Year, leading his team to a state championship in 1983. In the process, he would score 161 career goals, a state record. The ensuing interest in his ability, along with some adversity in competition, would lead him to make some crucial decisions in 1985 that would shape his future. Earlier, after gaining U.S. citizenship at age 15, Tab began his national career playing for the U-20 national team. He scored two goals, but the team did not make it out of regional qualifying for the U-20 World Cup. In 1984, at age 17, he was the last player cut in tryouts for the U.S. Summer Olympic squad, as the USSF embraced mostly newly eligible professionals. And in 1985, the U.S. failed to even qualify for the U-20 World Cup. In the midst of all of this, the New York Cosmos drafted Ramos with the tenth pick in the NASL Draft. But he chose to go to college instead, accepting a scholarship to play for North Carolina State and Coach George Tarantini for the 1984-87 seasons. There were initial difficulties due to “expectations,” in his words. But these would be outweighed by the love for his coach’s style and his attacking game. “He (Tarantini) was my type of coach … he helped me get to the next level.” The NASL, by the way, folded six months after that 1984 draft. Records bear out the wisdom of his decision. He was first team All-ACC and first team All-America in his sophomore, junior and senior seasons. In his 1987 campaign, he led State to the championship match of the first-ever ACC soccer tournament and would make the All-Tourney team while being the Wolfpack’s MVP. In addition, N.C. State would be selected for the NCAA’s in each of his four seasons. Later, he would be named to the ACC’s All-50th Anniversary Men’s Soccer Team. And as of 2015, Tab Ramos stood sixth in N.C. State history in career points (104), tenth in goals (31) and second in assists (42). The remainder of his soccer career has been well documented. Tab got his first national team cap against Guatemala in January, 1988 and would retire in November, 2000 with 81 caps and 8 goals, including the winner in a vital World Cup qualifier against Costa Rica in 1997. 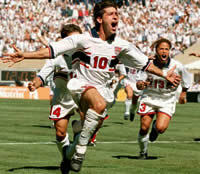 He would play for the 1988 Olympic Team and would be one of the first players in history (along with Eric Wynalda and Marcelo Balboa) to be on three U.S. World Cup teams (1990, 1994 and 1998). Ramos was also the first-ever player to sign with Major League Soccer in 1995 and went on to play 121 games for the New York/New Jersey Metrostars from 1996-2003. In 2005, he was inducted into the U.S. National Soccer Hall of Fame and later went on to serve as head coach for the U-20 Men’s National Team. On March 31, 2014 he was named as an assistant coach for the U.S. Men’s National Team by head coach Jurgen Klinsmann. We certainly feel the same. The 1980’s on the Raleigh campus were such a great time for all involved with trying to get soccer on solid footing. It was some show. And, as part of the list of honors, here is our appreciation with Tab Ramos in the North Carolina Soccer Hall of Fame.